Rinnie P. Styles — I got my First Acrylic Clutch from Milanblocks! Where my bag lovers at?! I’m ecstatic to tell you about my new bag from Milanblocks. One thing for sure, this is no regular bag! When I received my bag in the mail, I literally freaked out like a baby in the toy store. Note, I’ve never owned an acrylic handbag in my life! There is literally no limit to how to style this clutch. Whether you want to dress up or down, the sky is the limit. Keep reading to find out what I’m rocking with my bag! Today’s featured clutch bag by Milanblocks, named the “Art Abstract Paint Acrylic Box Clutch”, gave me so much inspiration when I was creating this look. Honestly, I really wasn’t going for a certain look, but I knew I wanted to have fun! Milanblocks is a handbag brand created by Purse Designer, Sara Cline. She’s known for creating some of the most coolest box clutches made from acrylics, animal prints, patent leather, florals, tropical effects, and crystals. One thing for sure, her bags have a signature look that you’ll never forget! Where did the Name Milanblocks come from? Milanblocks’ name is derived from Cline’s favorite high fashion city, Milan and the “block” part of the name comes from the shape of her bags. So cool how the name came all about! Where has Milanblocks Been Featured so far? Cline’s clutches has been featured in Elle UK, Seventeen, Cosmopolitan, People StyleWatch, and more! 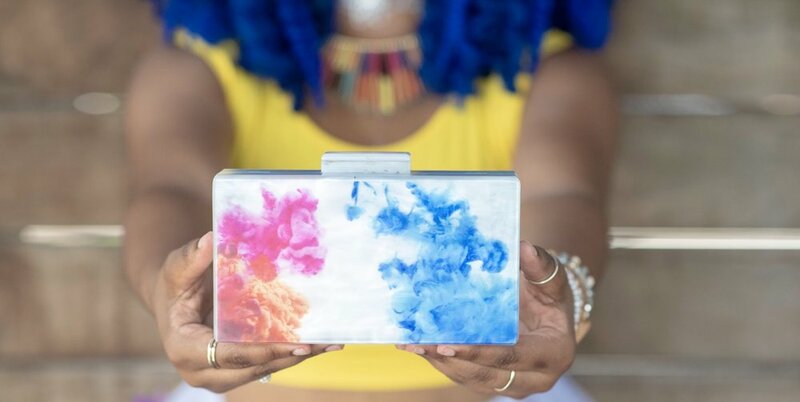 Her clutches has been seen on numerous celebrities from Grammy nominated Vocal Producer Jan Smith “Mama Jan” to entrepreneur Beau Dunn, and more. There’s no limit to what’s next for Milanblocks. Follow them on Facebook and Instagram to keep up with their latest arrivals! Is this Clutch Beneficial to Your Wardrobe? It’s a small bag but has enough space to fit your cell phone, important cards, and small beauty products etc. Not to mention, it’s perfect for an evening out but can also be transitioned with a casual look. There’s a chain on the inside, so you can rock it as a crossbody as well. If you’re loving my Art Abstract Paint Acrylic Box Clutch, you will definitely love more designs from Milanblocks. No joke, go see for yourself!